Axis LMS Progress and Score Weights – What you need to know. Many would argue that a three question quiz should not carry as much weight as a one hundred question, end-of-course final. By using tools built right into Axis LMS, you can give each of your quizzes and learning objects a numeric value to determine how much it should advance a user in their course. In short – you can make your end-of-course exam worth 20% of the entire course; while your short quizzes are worth far less. In fact, you can go a step further; any content you consider ‘optional’ or ‘practice’ can be added to a course, and carry no weight whatsoever. This allows your users to take on additional training before confronting the heavily valued finals, without forcing your other users (who don’t need the training) to have their progress hindered. Using Progress and Score weights efficiently also opens up new capabilities in your Page and Section display rules. Knowing how much a learning object will advance a user’s progress lets you coordinate the rest of your course more effectively; hiding and revealing other content as you desire. Some of the content you add into a course will be more time consuming or fulfilling to the user; others will almost be ‘extra’ content – something that compliments the course well, but isn’t required. Because of this, you can weigh the content you add into a course and, by extension, display a more accurate reflection on the user’s Progress Bars. Once you’re on the course management page, click on the Progress & Score Weights icon. Score Settings [above] only applies to graded learning objects (graded quizzes and offline activities) and will be used to determine the user’s final score for the course. You may, for example, want to assign a higher weight to graded quizzes as compared to offline activities, or assign a higher weight to a particular graded quiz – maybe it’s the ‘final’ quiz. Progress Settings [below] apply to every piece of content in the course; each completed item will increase the user’s progress bar by whatever percentage value it is worth. This percentage value is calculated by your Aix LMS when you assign it a numerical value. And in the example above, each piece of content is given a value between 0 and 2, depending on if we, as admins, care if the user completes the content or not. In our case, we’re really only concerned about Quiz completions – users can practice as they need. By giving content appropriate score and progress weights, you are able to expand upon the capabilities of your Sections and Subsections. A common practice is to create a section that only displays when a user’s progress is 100% – this section frequently contains a link to their course certificate. 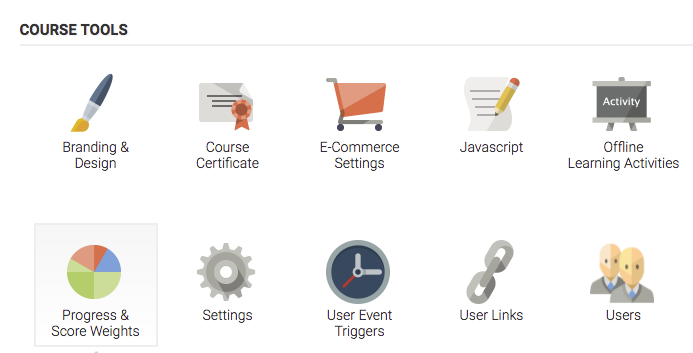 If you don’t want your users to be able to access a particular section of a course, you have the ability to hide course sections using section rules. 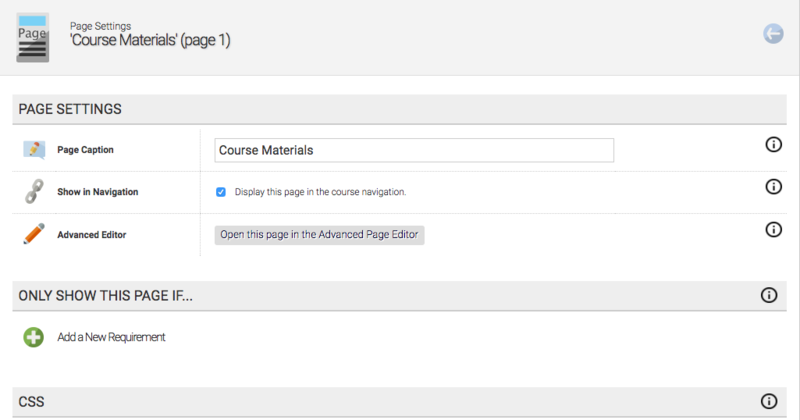 (Learning > Online Courses > Manage Courses > Manage > Page Manager > [default] Edit ‘Course Materials’ Page). Next, you’ll want to Edit the section settings (gear icon) for the section you want to hide. The section rules are located about halfway down the page. 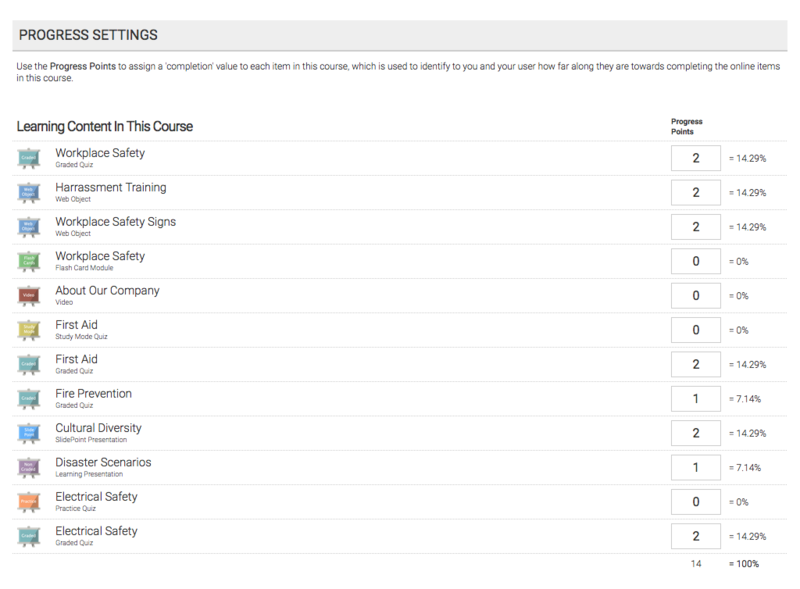 Under the Only Show this Section if… section, Add a New Requirement to Only show this section when the user’s course progress is less than 100%. Hiding this section will prevent users from accessing anything within it, including certificates. If you want your user to be able to access a certificate, you can add a new section that contains them – you can also add section rules opposite of this one: Only show when user’s current course progress is greater than 99%. This entry was posted on Wednesday, March 22nd, 2017 at 8:03 am	and is filed under ELearning 101. Responses are currently closed, but you can trackback from your own site.